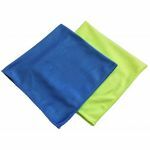 If purchasing 96 pieces or more please visit our Microfiber Wholesale Section for the bulk discounted price of $0.50 per cloth. 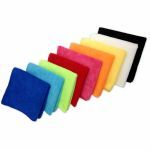 Our microfiber suede cloths are our most gentle microfiber. They are a lint free option for delicate use. 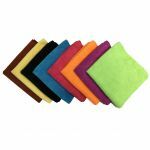 The suede microfibers are a gentle flat woven microfiber that are most commonly used in the electronics industry. They perform their best on phones, tablets, computers, cameras, and televisions. Simply brush them over the surface and off go smudges and finger prints, no chemicals or water even needed! They also perform very well on eye-glasses, musical instruments, wood polishing and much more! The auto industry can find these cloths useful on wood accents and navigation screens. An alternative to use as a lint-free glass cloth. Another great use for these towels is for make up removal from the face. It also helps exfoliate dead skin cells.